Mick Bolton… How many friends can you get into a caravan the size of a postage stamp? 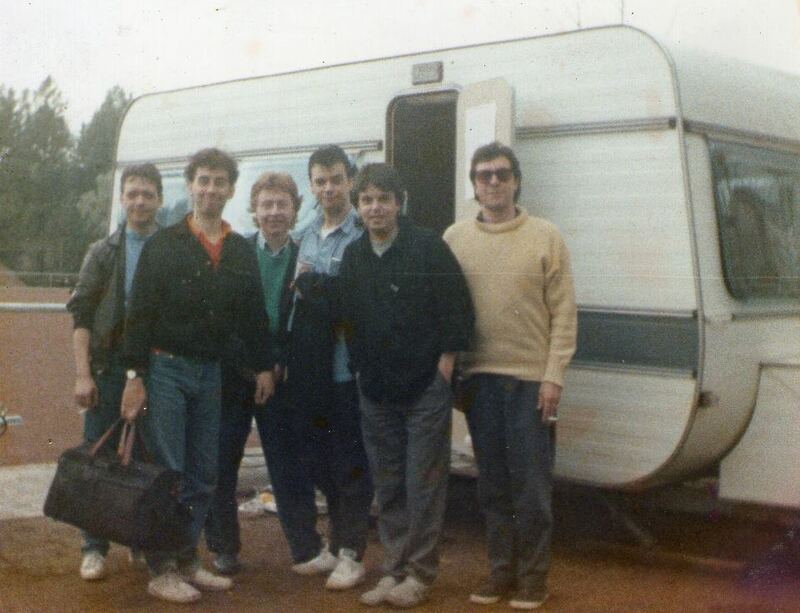 The Paul Brady Band 1986 – outside the sheer unashamed luxury of our dressing room at a German festival. Stephen D Fletcher, Jennifer Maidman, Paul Brady, Timothy Goldsmith, Mick Bolton, Geoffrey Richardson – and probably the tour manager Milo Lewis behind the camera. Reminds me of an episode of Father Ted. Tim Bruce… Or an episode of Cradle To The Grave…. Mick Bolton… I had no idea at that time that I would ever move to Hastings, though I’d visited the town on day trips and loved it. I remember Paul Brady talking about two of his former musicians who lived here – I thought ‘why would a musician want to live in a place like Hastings, so far from London? !’ They were Kenny Craddock (whom I replaced on Hammond organ) and Liam Genockey who later rejoined him and has worked with him for many years. Most of the band, including Liam, also played with The Penguin Cafe Orchestra. Geoff Richardson has been a member of Caravan for many years.